My friend Ted, who now lives in Maryland, happened to be passing through Pennsylvania on business. He stopped by for a visit. We were preparing to watch America's Favorite Orchestral Clarinet Players. (It was the reed adjusting portion of the competition that night! The peak drama of the show, most people would agree.) I discovered, a bit to my surprise, that there was no bacon in the fridge. "OK," I said, "let's go on a quick bacon run before we watch TV." We drove out to a shopping center about 15 minutes away. Ted had not visited since I had moved to this town, but the sameness of modern American suburbia was the same as ever, and so Ted didn't bat an eye as I pulled into the parking lot of a complex that included, among other things, a large supermarket. As we were chatting about this and that, we walked toward the shops and onto the sidewalk fronting the shopping center. Ted, by force of habit, turned in toward the supermarket entrance. "Come on," I said, "our stop is farther down." "Oh," said Ted, glancing around, "where at? This looks like the only place that sells food." "We're going to the bacon store." We continued walking. After a moment Ted repeated, "The... bacon store." "Yeah," I said. "Here it is." We walked into the store, which at least in terms of quantity was a bacon-lover's paradise. 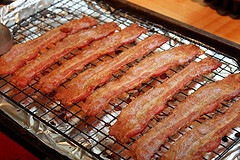 Cured, uncured, organic, small local farms, big national brands--there was a lot of bacon. This particular bacon store did not have a massive selection of artisanal bacons like some of the places in stylish Philadelphia neighborhoods, but it had a more adventurous stock than many. "A whole store for... bacon," deadpanned Ted. "Yeah," I said, "What brand do you like? " "Umm whatever you usually get is fine I guess. Wait, they have a whole store just for bacon? And people shop here instead of the grocery store?" There were a handful of other customers in the store. And while there was a small selection of lunchmeat, bread, and eggs, it was clear that this was the place for bacon. you were pulling my leg. This... wow, this is different." "You don't understand," I said, picking up a pound of Oscar Meyer and a pound of Gwaltney Applewood Smoked. "This place, and all the other bacon stores, are licensed by the state." "Yeah. You can't buy bacon anywhere in Pennsylvania, not at grocery stores, not at specialty butcher stores... anywhere except the licensed bacon retailers." "That's messed up. I mean, back home you can just pick up some bacon most anywhere that sells food." "I guess it is unusual," I allowed as we approached the cash register, "even by the standards of states that have more tightly controlled pork sales. But you get used to it. And the status quo is too entrenched to see much chance for change." "I... I had no idea," said Ted, dumbfounded. "That's a common reaction from out-of-state visitors," said the manager, who was catching the end of our conversation as he rang us up. Counting my change, he continued, "Once every few years we get a governor in Harrisburg who wants to shake things up. But we bacon distributors have enough clout that they haven't gotten away with it. No doubt about it, though, I'd be out of business in a minute if you could buy bacon over at the supermarket." "That's probably true," I said as I picked up the bag of bacon. "Come on, let's get back home and see how the show comes out. I hear one of the contestants is trying to get them to allow a synthetic reed." That bacon place is right next to the tape store isn't it? And what channel's that clarinet show on, now that Carol has her new Yamaha she might want to see that competition!